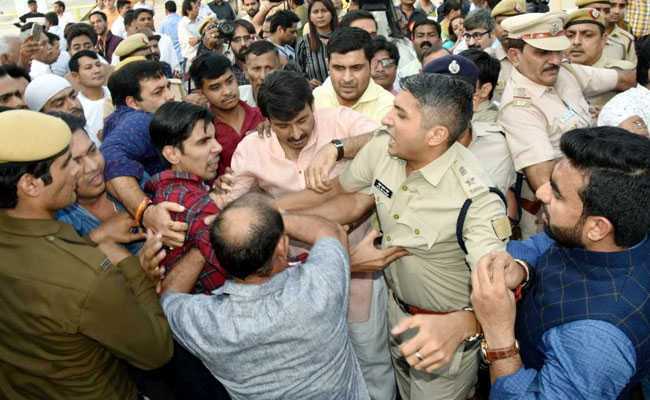 Manoj Tiwari Files Complaint Against Arvind Kejriwal Over "Attack On Him"
Manoj Tiwari made a written complaint to the Deputy Commissioner of Police, Northeast Delhi, on Monday against the two and some unknown others. Some media reports had said that Manoj Tiwari had manhandled a policeman, which he denied. Delhi BJP President Manoj Tiwari has lodged a complaint against Chief Minister Arvind Kejriwal and AAP's Okhla MLA Amanatullah Khan over the attack on him during the inauguration of Signature Bridge on Sunday. He has accused Khan of pushing and manhandling him during the inauguration by Mr Kejriwal in the Wazirabad area on Sunday and described the episode as "unfortunate" as he was an invitee of the Delhi government. In his complaint, he said: "Amanatullah Khan, under the instructions of Arvind Kejriwal, manhandled and physically assaulted me in presence of my supporters..."
"...with the intention of killing me and/or causing grievous injury, he came towards me and pushed me suddenly and forcefully from a certain height... If someone falls from such a place, then he will suffer grievous injury or die."